Each of the last several years, teams of Northwestern JD, LLM, and Master of Science in Law (MSL) students have spent Spring Break in Silicon Valley studying innovation, technology, and law. This year, ten MSL students and one JD student have made the trip to San Francisco for the Entrepreneurship Team Project (EnTP) class. 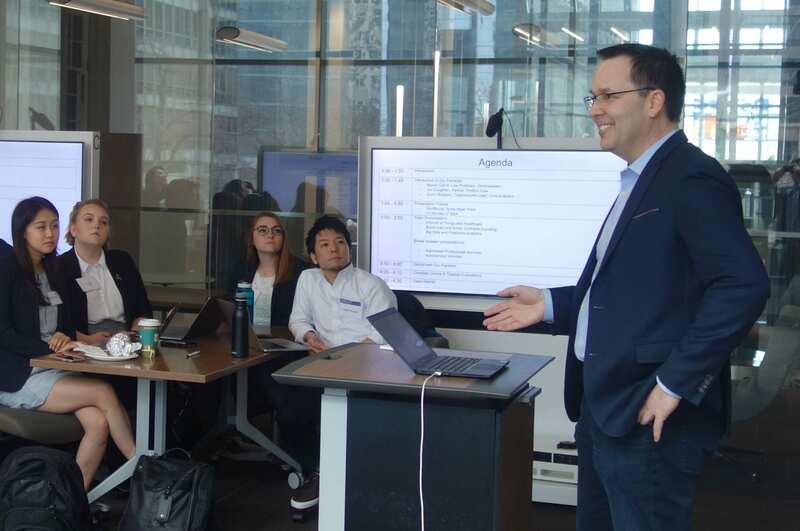 The class, taught this year by Professor Dan Linna, includes visits with emerging startups, law firms, legal technology leaders, and some of the world’s largest companies. Linna, Professor Leslie Oster, Director of the MSL program, and Evan Goldberg, Director of the MSL program’s external outreach efforts, coordinated the trip and will accompany the student teams. We will document the EnTP trip on social media, including Twitter, LinkedIn, Facebook, and the MSL blog. A component of our classroom work included developing a social media plan. The goal is to provide useful information to those interested in the intersection of innovation, law, business, and technology. Please follow along, propose questions for our guests, and engage with us by looking for our hashtag, #NLawEnTP. Thank you to the people and companies who have opened their doors to us and our students. We cannot wait to meet with you this week. For everyone else, stay tuned for insights, photos, videos, and more from the trip, all which will include the hashtag #NLawEnTP. If you like what you see, please support us and our students by liking, retweeting, and sharing our social media content. Thank you in advance! The MSL program is a unique offering at Northwestern Law. Learn more about this innovative law program for scientists, technologists, engineers, mathematicians, healthcare professionals, and other STEM professionals who wish to blend their expertise with law and business. This entry was posted in Student Life, Uncategorized and tagged EnTP, Entrepreneurship, NLawEnTP, Silicon Valley, Spring Break, Travel. Bookmark the permalink.